Prominent & Leading Wholesale Trader from Chennai, we offer colour inkjet workforce pro wf-c869r- 4 tray, epson colour inkjet workforce pro a3 13/19 size, epson business multi function printer and epson wf-c20590 (100ppm) printer. High-Speed, High-Definition PrintingEnjoy default print speeds of up to 20 ipm in black and color, draft print speed of up to 34 ppm in black and 30 ppm in color. Epson’s PrecisionCore printheads deliver print resolution of 600 x 600 dpi for standard prints, and up to 4,800 x 1,200 dpi for prints with special media. What’s more, there’s hardly any warm-up time, with a first page-out time of less than 7 seconds. Epson RIPS printers only need periodic replacement of basic components, eliminating supplies wastage, and the need for complicated collection and recycling programmes. Also, the CO2 emissions of Epson RIPS printers are remarkably low. Lower power consumption and minimised wastage not only reduce costs, but also significantly contribute to reducing environmental load. With Epson RIPS, business printing becomes eco-conscious. Epson’s DURABRrite Ultra inks are water-insoluble and pigment-based. An infused resin fixes colourants to the paper. Increased pigment concentration gives you brighter colours, even on plain paper. As the pigment is non-soluble, you get long-lasting prints that are water and fade resistant. Equipped with Ethernet, Wi-Fi, RJ-11 fax, Wi-Fi Direct* and USB 2.0, the WF-R5691 is perfect for office environments. 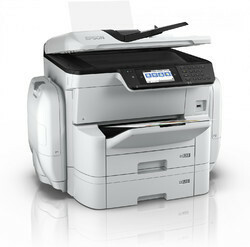 Wi-Fi Direct acts as an access point, allowing up to four devices to connect directly to the printer at a time. And with EpsonNet Config, you can easily change your network settings remotely. Scan with impressive speed in both simplex and duplex. The dual CIS technology allows duplex scanning in a single pass, resulting in significant improvements in office productivity. Reduce risk of information leaks by limiting the access to functions for up to 10 user accounts. 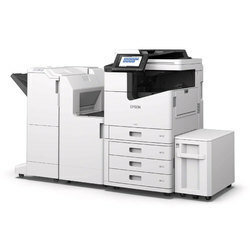 Revolutionizing business productivity, the WorkForce Enterprise WF-C20590 color MFP blazes through prints at 100 ISO ppm†, the fastest in its class1. Powered by PrecisionCore® Line Head Technology, this flagship network performer not only delivers breakthrough speed, but brilliant-quality output. A powerful but efficient workhorse, it utilizes up to 50 percent less power than color lasers1 and keeps operating costs in check. And, it supports convenient print management solutions. 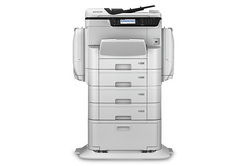 Print from mobile devices2 or scan to the cloud3 via a user-friendly touchscreen. Featuring a 5,350-page maximum paper capacity4 and dual-head scanner, this high-performance inkjet has everything large workgroups need, with none of the hassle.